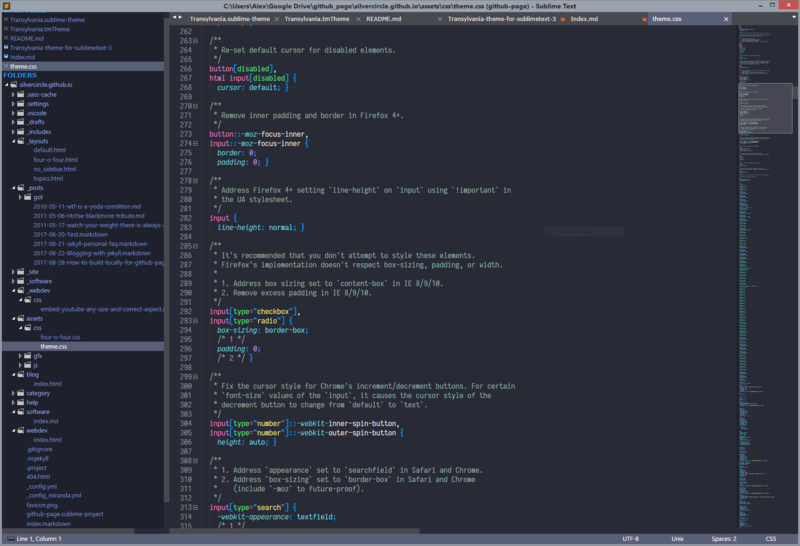 ST-Transylvania is a theme for Sublime Text 3 that harmonizes well with the dracula color scheme. Well, right now it’s not much. It’s some sort of playground to test Jekyll, a static page generator that has enough flexibility to build a blog or documentation site, but leaves out all the bloat that makes modern content management systems slow and prone to security problems. It also significantly lowers the requirements for hosting to a simple web server that can serve static files. Jekyll is also supported by GitHub pages who give you essentially unlimited free web hosting, but won’t allow you to run PHP, Python, Java or whatever else on their servers. But you can use Jekyll either locally to build your static site or let GibHub run it whenever you change content. Plus, you get free awesome revision control for your entire site. Never lose a change or important article again.